Thnks for the info surprised they included it in the class of 2018 on the ECNL site. serious congrats to all that signed and those still making their decision. It's all fuzzy Okie just par for the course. Deception to fluff the marketing. Is there somwhere they have the GDA numbers on college signings from this initial year? Comparing the DA and ECNL signing day numbers, anyone else surprised how many more ECNL girls signed? DA reported signing 1056 boys and girls and ECNL reported signing 1157 girls. That's a pretty big difference. 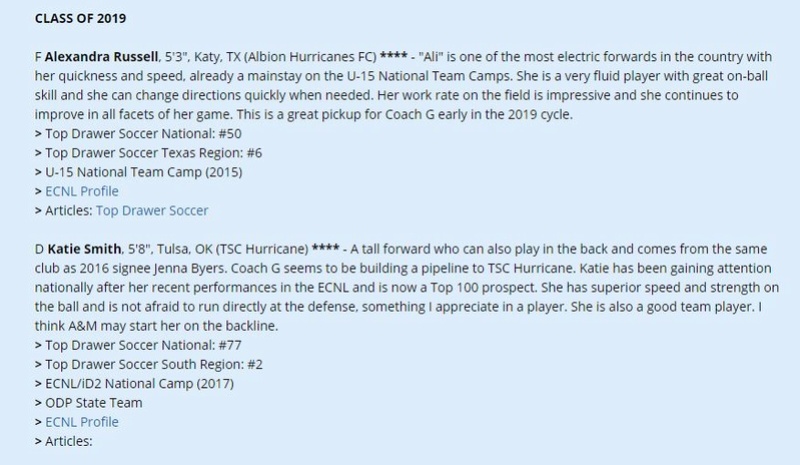 Okie - Looks like TSC accidentally listed Katie Smith as a signee instead of Katie Gasaway. I'm sure it was just a reporting error but Katie Gasaway did sign yesterday. Here is a list of current TSC signees. I am shocked Sting Austin signed more that Sting Dallas. 918soccer wrote: Comparing the DA and ECNL signing day numbers, anyone else surprised how many more ECNL girls signed? DA reported signing 1056 boys and girls and ECNL reported signing 1157 girls. That's a pretty big difference. Not really suprising. This is the inaugural season for DA on the girls side. I would guess that most of your older girls who already had offers, stayed ECNL. It doesn't make sense to go DA for them. The younger age groups is where you will see the trend shift. I would look at and follow the 03's as the litmus test. Would agree that it will take a bit of time for the girls to even out. 03’s might be the perfect year or even the 02’s for it to happen. However why is the boys number low? They had plenty of years. The boys have more options that committing to a college. Some might have taken a pro contract. Any word on Boys ECNL signing numbers? I agree KC and I was anticipating ECNL to have higher numbers this year, but I didn't expect them to sign twice as many girls or for Sting Austin to sign more players than DA teams their first year in ECNL. That throws me for a loop and really makes me question the college recruiting differences between both programs. Congrats to all of the dds who will play at the next level and to their parents for all of the support to make the next level possible! Awesome accomplishment!! Wow. PDA has some smart girls. That is an impressive list of colleges that the PDA girls are attending. c) PDA is arguably the best club in the country and pulls from some of the most affluent areas in the country. Do the math. d) Congrats to the commits. You parents enjoy it! It goes by fast!